ARCADIA, Calif.— Angeles National Forest officials are preparing an environmental impact statement to consider providing limited, managed recreational activities in the vicinity of Williamson Rock. Officials are currently asking for public comment on their proposed action that would allow year-around access to the Pacific Crest National Scenic Trail and limited seasonal access to Williamson Rock for climbing, while protecting the federally-listed mountain yellow-legged frog (Rana muscosa)and other unique resources. The area has been closed to the public since 2006, either by forest order or court injunction, to protect the frog. 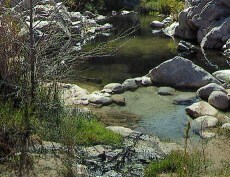 Williamson Rock is on the Angeles National Forest’s Santa Clara-Mojave Rivers Ranger District, in upper Little Rock Canyon. The public comment period will continue through Sept. 5, 2104. Comments received will help determine the range of issues and alternatives to be considered in the analysis. A full description of the proposal can be viewed online at: http://www.fs.fed.us/nepa/nepa_project_exp.php?project=43405. Comments may be mailed to: Jose Henriquez, Williamson Rock, Angeles National Forest; 701 N. Santa Anita Ave., Arcadia, CA 91006-2725. Comments may also be e-mailed to: comments-pacificsouthwest-angeles@fs.fed.us . Please use “Williamson Rock” as part of the subject heading/e-mail title. This proposed project is subject to a pre-decisional administrative review process in lieu of the post-decisional appeal process that had been used since 1993. To object, the person must have previously submitted timely, specific written comments during the public comment periods, unless the objection concerns an issue that arose after the opportunities for formal comment were over. Williamson Rock area will remain closed until the Forest Service develops measures for managing the area, completes the National Environmental Policy Act process necessary to implement these measures, and resolves the provisions of Court Order C 08-01278 MHP.